I, too, was called bossy growing up. I am still sometimes called bossy. Sometimes I call myself bossy. Sometimes I am bossy. Now that the seemingly required disclaimer about my own personal history with “bossy” is covered, I would like to say this: I think “Ban Bossy” is disempowering. This is not to say that I love the term bossy or how it is used to imply that girls and women are overstepping the bounds of what is conventionally accepted as appropriate leadership from a woman. I actually think how “bossy” is used is pretty indicative of a pervasive problem. Educational Psychologist Linda Kreger Silverman argues that in children and adolescents, girls are called bossy when they are demonstrating traits that would be called leadership in their male peers. Worse, she found that girls are more likely to attribute their successes to luck, easy assignments, or teacher preferences and their failures to lack of ability (13-14). There is clearly a problem with the gendered implications about leadership there. And I think any assessment of the glass ceiling in American business, politics, media, education, etc. shows that it’s still pretty much in tact. 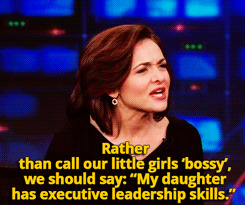 I think early on, in promoting Lean In, when Sandberg started talking about the idea of not calling girls bossy, she was hitting on our perceptions of who a leader is rather than getting up in arms about a single word. I agree that there is work to be done on sexist ideas and rhetoric about leaders and leadership. I think it would probably do a lot of good to talk about leadership differently, more inclusively, with the girls and women, boys and men, people we know. I just think banning bossy comes of as petty and tries to do a lot symbolically when there’s practical, hard work that could be done instead. Furthermore, and to me most importantly, I think the campaign plays into a “Save the Girls!” rhetoric that portrays girls as victims who need to be saved, in this case from a mean word. If you watch the video embedded below, not only does the narrative heap a whole lot of cultural baggage on a single word, it implies that girls will just be shut down by being called bossy. On one hand, the problem is more far-reaching than “bossy,” on the other, if girls are going to be effective leaders, they’re going to have to be a bit more resilient. Making progress, leading, is about overcoming obstacles, isn’t it? I’m a pretty sensitive, nurturing person and even I think that “Ban Bossy” comes off as coddling, implying that girls aren’t tough enough to let bossy roll off their backs. There’s a lot of institutional sexism that women in leadership positions–women in any walk of life–have to overcome. If they’re not calling you bossy, they might be calling you a different b-word, or paying you less, or objectifying you, etc. Instead of banning bossy, we could do more to encourage girls to lead and to teach American culture how to embrace women as leaders. Ban Bossy does provide leadership tips for girls, parents, teachers, etc. (and I will say, the tip about not apologizing before you speak is important and seems pervasive, even for women in grad school.) That’s helpful, but it’s not getting the attention. Instead of focusing on banning bossy, then, we could more productively dedicate time and energy to teaching and mentoring girls on how to lead, how to tell what is/isn’t constructive criticism, how to be resilient, and how to persevere. Moreover, we can promote media coverage of female leaders while calling out gender bias such as focus on the appearance of female leaders rather than their work. Miss Representation did something like that when they started the #AskHerMore trend on Oscar Night, pointing out how little women in film were asked about their achievements compared to the men. And, like Hillary Clinton once said, “You may not agree with a woman, but to criticize her appearance — as opposed to her ideas or actions — isn’t doing anyone any favors, least of all you. Insulting a woman’s looks when they have nothing to do with the issue at hand implies a lack of comprehension on your part, an inability to engage in high-level thinking. You may think she’s ugly, but everyone else thinks you’re an idiot.” I think a similar attitude could be taken to bossy. Girls, if they’re calling you bossy either you’re (probably) getting somewhere, or you’re (possibly) outreaching your authority or credibility. Learning to tell the difference between the two can help girls be better, stronger, more resilient leaders in a way that I don’t think “Ban Bossy” can. The Actual, Helpful Aspects of the Ban Bossy Website <–Why rhetoric is important, because this is not the part highlighted by the message getting all the media attention. Kreger Silverman, Linda. Who Cares If I’m Smart, Am I Thin Enough? Proc. of European Council of International Schools, The Hague, The Netherlands.